The Konvi Plus infrared heater with thermostat – the perfect result of combining infrared and convection technology with a premium design. 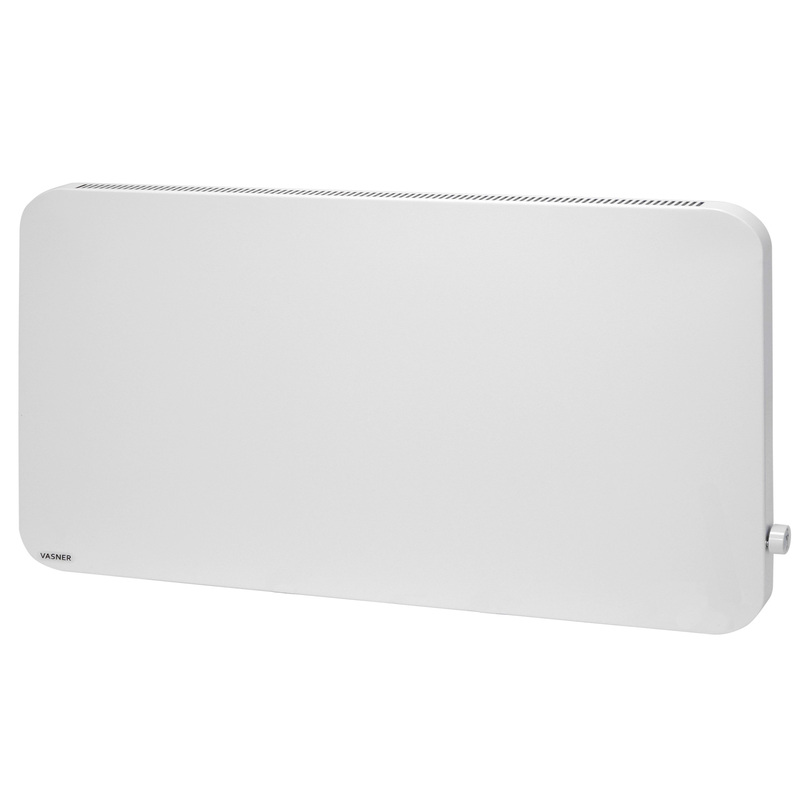 When it comes to design and efficiency, the new hybrid infrared panel heater Konvi Plus is an indispensable element in the field of infrared heating. The Konvi Plus is based on the successful hybrid technology of the VASNER Konvi series. Our designers refined the exterior of our Plus series’ products in order to transform them into optical gems. Consequently, the infrared heater with thermostat is a true designer piece for your home. 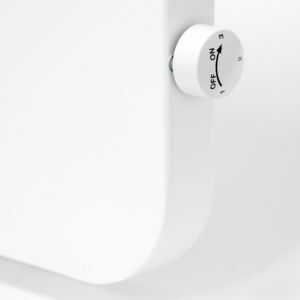 The Konvi hybrid series has already proven to be an ideal combination between infrared radiation and convection heating, displaying a perfect connection of these two heating techniques. Now, a modern and unique design was composed to add to this innovation. The new Konvi Plus hybrid infrared heating panel is so appealing, it can be used as a focal eye-catcher that is intentionally shown off in your living space. In the field of far infrared heating panels, the rounded design of the Konvi Plus is pure innovation. The hybrid infrared panel heater’s exterior metal casing features rounded corners and is manufactured in an elaborate process. During manufacturing, it is carefully ensured that the rounded corners specifically facilitate the convection air flow within the device. The product’s full metal body perfectly transmits the infrared radiant warmth without losses to its environment. 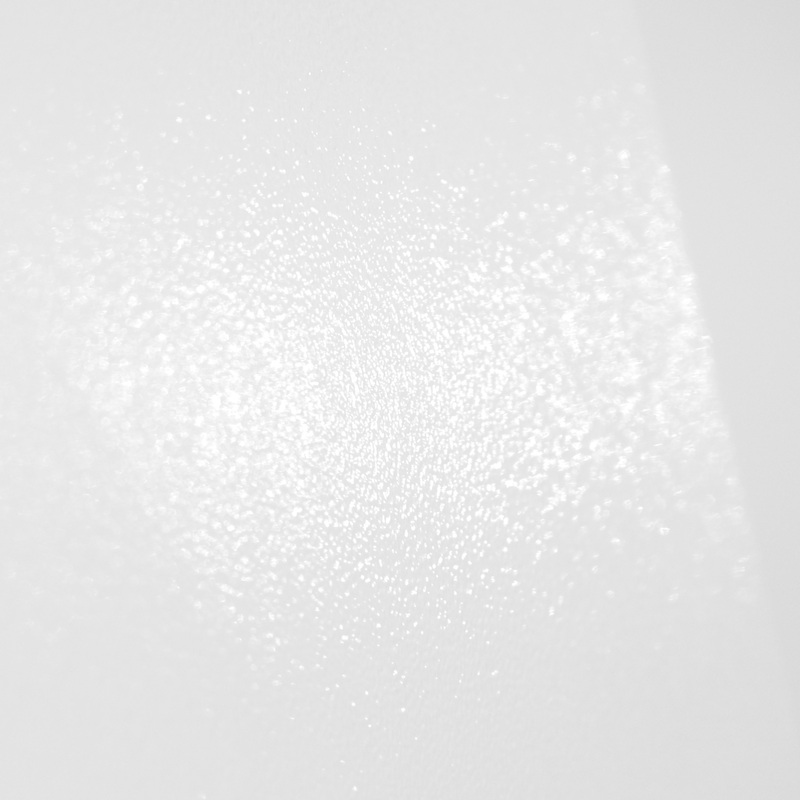 Due to the exceptionally fine surface texture, the energy is slightly dispersed as per the diffusion principle. As a result, the infrared heater with thermostat exhibits a more even distribution of radiation. The exterior casing of the hybrid infrared panel heater is made in such a way that a chimney effect is created; the cold ambient air in the lower area of the Konvi Plus is drawn in and subsequently emitted as warm air.  The products’ infrared radiation works externally as well as internally; therefore, it can achieve the advantage that results from the combination of infrared radiation and convection. 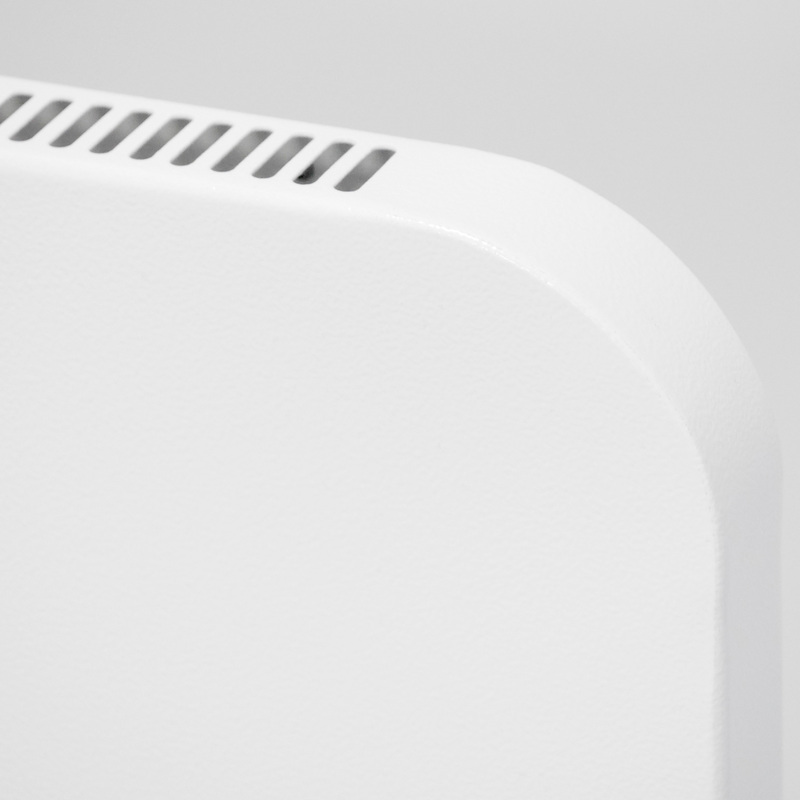 The benefit compared to a regular convection heater lies in the fact that it does not have a dehumidifying effect on the room air while still effectively heating it up. The combination of the two heating technologies enables the VASNER Konvi infrared heater with thermostat to warm up a room substantially more quickly compared to a regular thermal wave heater. As a result, the hybrid infrared panel heater is often used in colder rooms that require the temperature to be raised to a comfortable level in a swift manner. 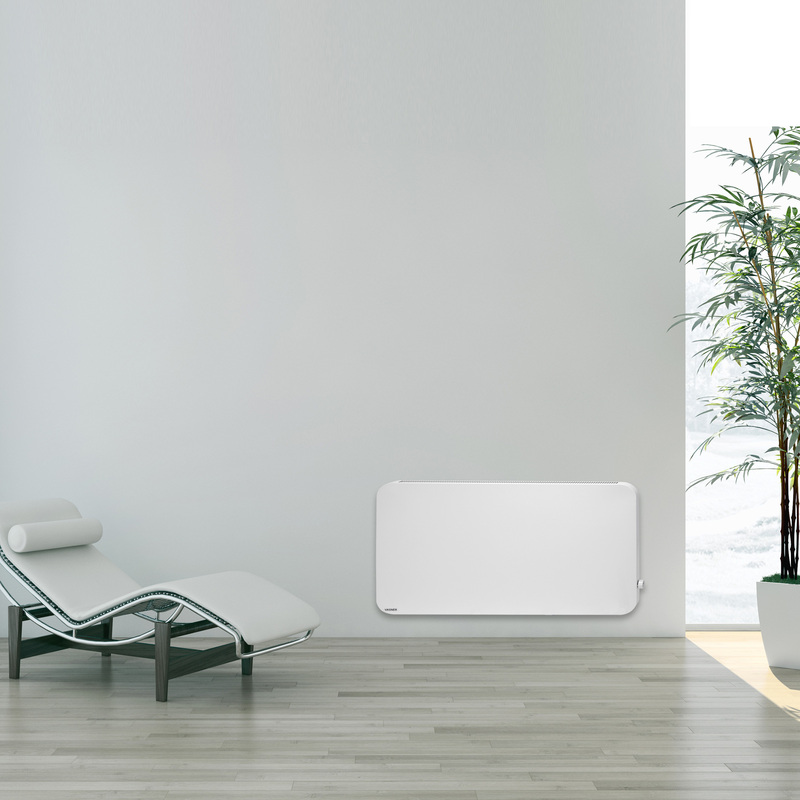 Pleasant infrared heat with the additional benefit of a much quicker rise in the room air temperature – The VASNER hybrid approach. 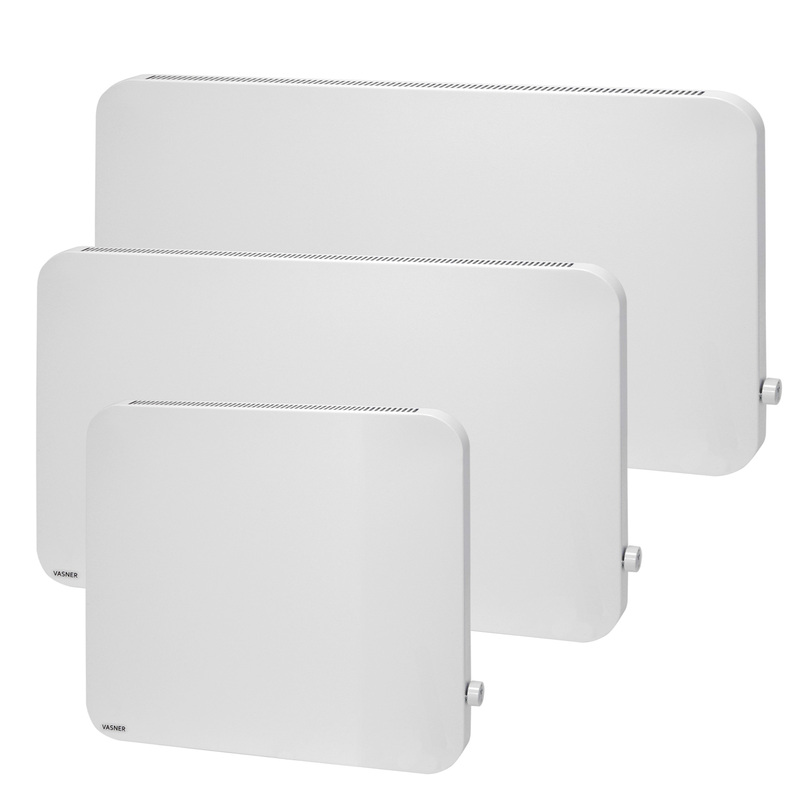 Just like the classic Konvi-Series, the rounded Plus products use newest infrared technology. 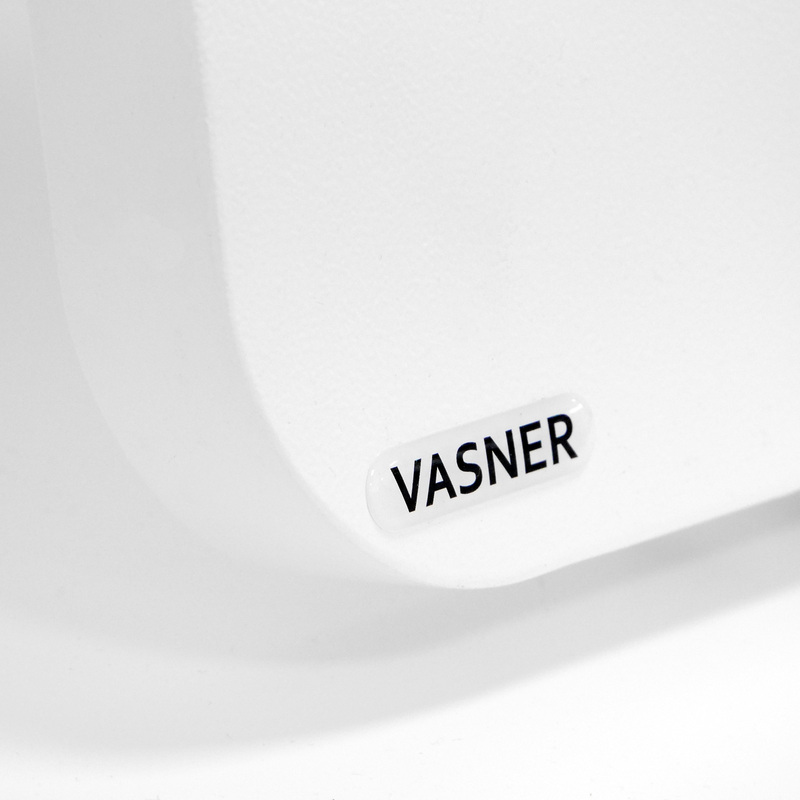 VASNER infrared technology has evolved and improved over the course of many years and today, it is one of the most efficient heating techniques available. See for yourself and experience the difference in radiant heat intensity. When manufacturing the rounded infrared heater with thermostat, particular attention is paid to the heating filament extending all the way into its edges. Enabling the wall mounted panels to radiate heat evenly across their entire surface area. 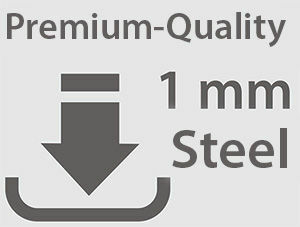 This distinguishes high quality from mass production. The infrared image shows an even heat distribution. Despite the new rounded design, the hybrid infrared panel heater features a flat case depth of only 4 cm. 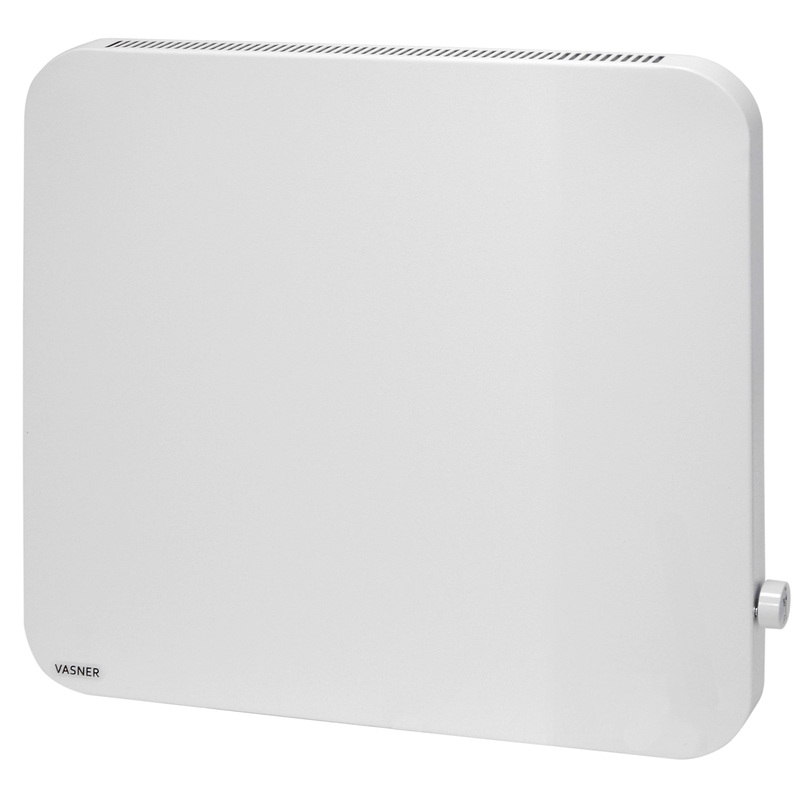 Including a mains plug and thermostat, the Konvi Plus hybrid heating panel is immediately ready for use anywhere. Without any additional accessories, without any extra costs. Additionally, the infrared heating system is easily and quickly mounted as well. 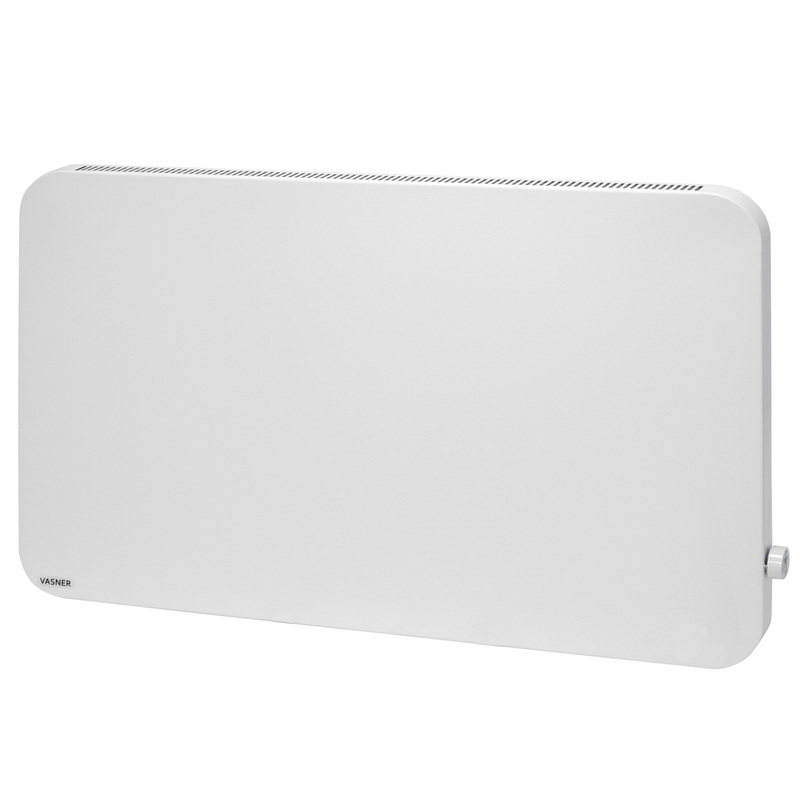 To allow for a quick and smooth mounting, the VASNER Konvi Plus hybrid infrared panel heater is sold with a matching wall mount included. With the help of the included screws, simply attach the mount to your preferred wall within minutes. Now, all that is left to do is to lock the infrared heater with thermostat into the mount and you are set up and ready to heat. In case you do not wish or are not able to permanently install your Konvi Plus hybrid infrared panel heater on your wall, the specially configurated VASNER bases allow you to use the Konvi Plus flexibly. These convenient accessories can be fastened to the back of the infrared heater with thermostat using only a few screws. 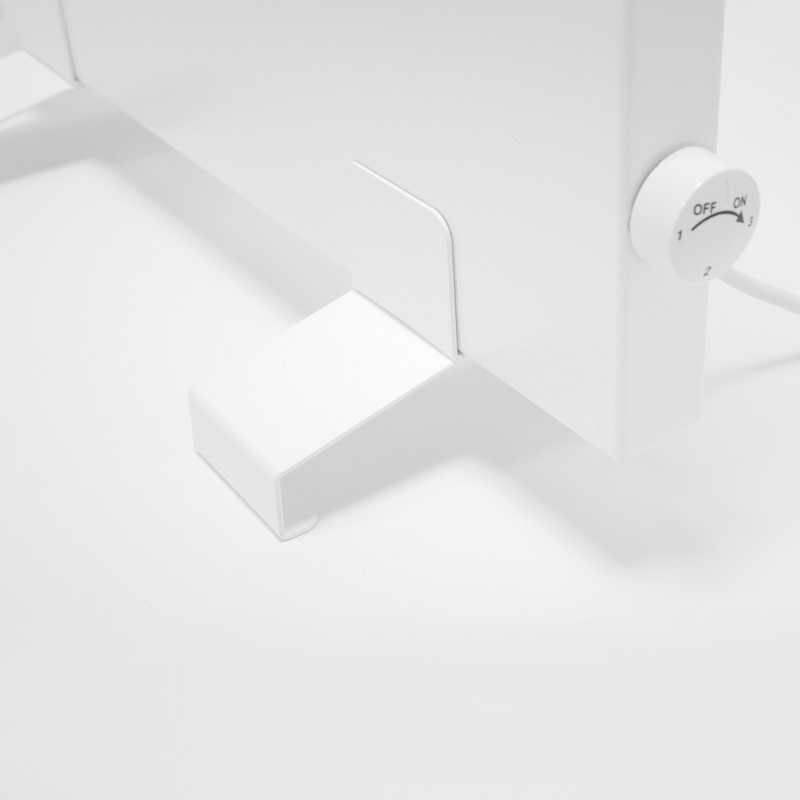 Allowing you to turn your Konvi Plus into a flexible, independent mobile heater within minutes. Therefore, the portable Konvi Plus infrared heaters can be moved from room to room depending on your heating needs. The supporting feet also allow you to angle the hybrid heater for an ideal heat radiation, for example to comfortably warm the leg area under your desk. The bases maintain a 10 cm gap between the infrared room heater and the floor which ensures that the convection can continuously take place and thoroughly heat up the room air. You can additionally order the Konvi bases in the VASNER online shop for house and garden. With the integrated thermostat rotary switch, you can automatically control the warmth of the hybrid infrared panel heater. The thermostat control can be adjusted continuously and therefore allows you to precisely choose your preferred temperature. Once adjusted, the Konvi Plus automatically keeps your preferred comfort-temperature constant while heating. Therefore, you do not require an external thermostat as you would with other far infrared panel models. Konvi Plus electric infrared heaters – Latest technology for added comfort. Set decorative highlights with the Konvi design series in your home, basement, conservatory, office, or other work spaces and enjoy the quick and pleasant warmth. When it comes to hybrid infrared panel heaters, VASNER is a firm believer in 1 mm steel material strength. Considering the cheaper infrared models on the market that merely use 0,7 mm steel, this poses a noticeable, important difference. 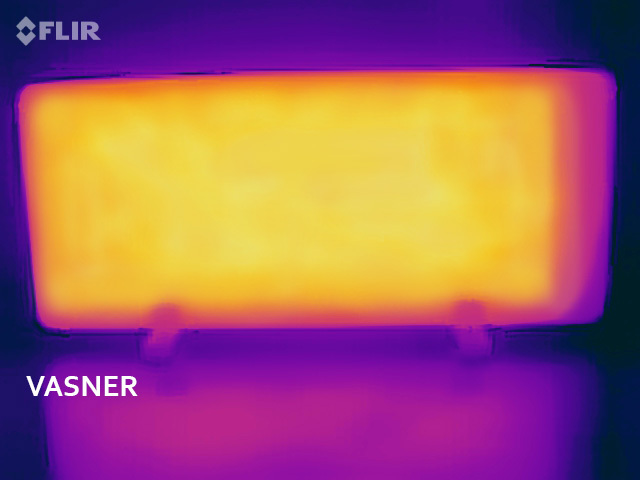 Although not immediately visible to the customer, this is a significant quality difference that really matters, as robust stability is an important criterium when it comes to infrared heating panels. Trust in the 1 mm steel quality of VASNER.